I don’t know what I was thinking. Or rather, I wasn’t thinking. Like a lamb being led to slaughter, I followed our friend Jack into Oriol Balaguer’s chocolate kitchen in Barcelona. I knew I was a dead duck the moment I walked in. The sweet spicy scent of Gran Cru chocolate filled the air, and streams of satiny liquid chocolate poured exuberantly into stainless steel sinks. It was like being transported into paradise. It’s true confession time. I used to belong to a Chocoholics Club. Note the operative verb: “used to.” Once a month, one of the members would make an over-the-top chocolate dessert, which we would savor briefly and then devour. Devotees of chocolate we were—and some of them still are. For health reasons, I had sworn off the dark, creamy, butter-and sugar-laden delights. And, except for an occasional lapse, I usually avoided succumbing to temptation. So what was I doing in Balaguer’s High Temple of Chocolate? Jack (www.discovergirona.net) leads specialty tours in Catalonia, and the opportunity to do an interview with master chocolatier/pastry and dessert chef Oriol Balaguer was too good to pass up. I hadn’t considered the consequences—but now I knew. I knew I would live to regret it—but I also knew, as I took another deep, soul-satisfying inhalation, that I didn’t care. Oriol has been winning prizes for his chocolate and pastry creations for the last 17 years—and he’s only 39. Best Pastry Chef, Best Book (The Dessert Book) in the World, Professional of the Year—the accolades don’t stop. Not only is he a brilliant inventor, he’s also a master marketer. He’s turned buying chocolate into a time-valued event. When is chocolate like haute couture? When you are Oriol Balaguer and you present twice-a-year collections of new tastes, textures, and shapes. Last season’s collection is so last year—but so good that it is still available and still in great demand. 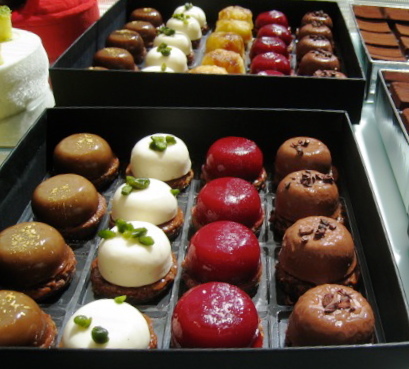 Oriol also launches monthly “concept cakes” in his specialty shops, where each item is displayed like a precious jewel. Suddenly, everyone wants to purchase the latest product, score the most recent release for their dinner party. You get the idea. What next, I wondered, while ogling his incredible Easter eggs (foot-high confections with whimsical decorations); 8 to 10 new ones are released each year. His delicate latticework spheres left me pondering how he made them. And his cakes—to call them “cakes” is like calling a Ferrari a car. A red velvet sensuous circle of enchantment, called “Insinuation,” is a confection of Tahitian vanilla mousse, compote of roses, litchis and raspberry, chocolate sponge cake, and crunchy cookie. An alluring chocolate confection, “el Paradigm,” was created in 2001 and declared the “Best Pastry in the World”; it resembles a lush top hat and contains eight distinct chocolate textures. It will go down—it already has!—in history. But I digress. That’s the genius of it all. Oriol’s creations are not just food for the belly, they’re food for the eyes—and food for thought. He’s not so much a chef as a composer, playing with the different “instruments” of chocolate, cream, eggs, flour, sugar, fruit, nuts and spices to create the complex melodies of a specialty cake or a single exquisite cocoa-pod-shaped piece of filled chocolate. Some of us are called to be doctors, or tennis players, or writers. Oriol knew from an early age that his calling was to be a chocolate, cake, and pastry chef. But not just any pastry chef—an over-the-top creative genius. What began eight years ago as a small kitchen-shop in Barcelona, run by Oriol and his wife, has now blossomed into several showcase stores, two separate kitchens (one for chocolate, one for baking and his “Sweet and Salty” catering business), a new bakery selling his “Classic Line” of cakes and more than 50 artisanal breads, and a staff of 25 dedicated assistants. He also has a shop in Madrid. Franchises are thriving in New York, Riyadh, and Tokyo. Temperature-controlled carriers ship his chocolate from Barcelona to all over the world. I suggested Santa Fe, New Mexico, where we used to live. He said he’d think about it. And I’m sure he will, in between inventing new concepts, new products, and new taste delights—like his explosively popular “fireworks pop rocks” that delicately explode in the mouth. With a flourish, Oriol pulled out a large silver box, “High Techocolate”—his best product, he assured me. On the left were 36 chocolates, each shaped like a miniature cocoa pod. “It’s my homage to the cocoa bean,” he explained. Arranged in rows, with labels on a translucent paper above, the chocolates have twelve different flavors and can be used to play a tasting game, similar to wine tasting. Can you identify the one filled with yuzu, a Japanese citrus flavoring? Or scented with Earl Grey tea? Or how about the one with seven spices? On the right in the box are ten bars, each with a different mix of ingredients, each made from a different kind of cacao bean, each with a different flavor. And in the center, a CD explaining the history of chocolate; ending with a description of the high-tech world of modern chocolate making. The scent of chocolate was intoxicating, and I started to drool. Oriol took pity on me and offered me a hand-made cocoa-pod. The outside was smooth and shiny, slightly variegated in tone and texture. First I admired it as an artistic object; then I took a slow, conscious bite. My teeth sunk through the crisp, dark chocolate shell and landed in creamy hazelnut praline. A hint of mandarin expanded in my mouth and then—surprise! Embedded “pop rocks” exploded, releasing delicious tingly tastes and delicate “pops.” I sighed in contentment. I knew I was a goner, a failed member of Chocoholics Anonymous. I didn’t care. I licked my lips. I sighed. Could it get any better than this? I doubted it. But to find out for sure, I walked over to Oriol’s Barcelona shop and purchased a large box of assorted chocolates from this season’s collection. I strolled down the street, swinging my metallic-black Oriol Balaguer shopping bag. Never before had chocolate made such a fashion statement.